J. Chalmers Doane, C.M., O.N.S., B. Mus. D.F.A. 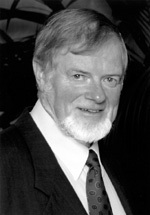 Jim Hill was beloved throughout the Maritimes as one of the two founding "daddies" of the Christmas Daddies Telethon, one of the longest-running telethons in North America. Thanks to his compassion and commitment, Christmas Daddies has raised over 27 million dollars to provide toys, food, and clothing to less fortunate children across the region. 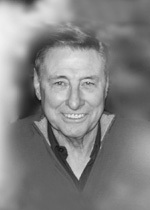 Jim Hill joined CJCH-TV when it opened in the early 1960s, and rose through the ranks to become an award-winning producer and director for programming and news. On a cold, slushy day in November 1964, Jim and his colleague, Jack Dalton were having lunch at a Halifax tavern while a poorly clothed boy, not much more than eight years old, was repeatedly being thrown out of the tavern for panhandling. When they saw him return a third time, Jim and Jack intervened. They discovered the boy needed money to buy bread and milk for his mother and baby sister. Jim and Jack passed a hat, the boy went home with fifteen dollars, and Jim had discovered his life's work. He and Jack immediately hatched plans for the telethon, to ensure fewer children were faced with such a plight at Christmas. The Christmas Daddies Telethon has been running for 46 years, with Jim Hill at the helm, inspiring hundreds of volunteers to help thousands of less fortunate children and their families. Although Jim is no longer with us, his compassion lives on in the Christmas Daddies legacy. A fierce champion of racial equality and justice, Rocky Jones has devoted his life to the fight to achieve these ideals. He is an outspoken promoter of social reform in the areas of justice, employment, housing, and education. His legendary community leadership has changed the lives of many Mi'kmaq and African Canadians. 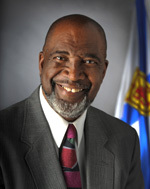 Believing that African Canadians need to work together for change, Rocky Jones helped establish the Black United Front of Nova Scotia and the National Black Coalition of Canada. He also helped create two Dalhousie University programs - the Transition Year Program and the Indigenous Blacks and Mi'kmaq Initiative. The Transition Year Program was designed for First Nations and African Canadian adults to redress educational inequities faced by members of the First Nations and African Canadian communities. The Indigenous Blacks and Mi'kmaq Initiative was established with the purpose of reducing discrimination by increasing the representation of Indigenous Blacks and Mi'kmaq in the legal profession. Rocky Jones was the valedictorian of the first graduating class of the Indigenous Blacks and Mi'kmaq Initiative at Dalhousie Law School. He now heads his own law firm devoted to human rights, as well as labour and criminal law. He is revered among his peers for having successfully argued a groundbreaking case before the Supreme Court of Canada in 1997 that set a precedent for race related litigation and contextualized judging. He also frequently takes on cases with no expectation of compensation. He has worked closely with the Aboriginal community on land claims, justice, and educational issues, and is a Canadian expert on environmental racism. Dr. Burnley "Rocky" Jones is an unrelenting and courageous crusader, devoted to creating a more just society. Eva June Landry, C.M., O.N.S. A deeply committed educator and passionate advocate for rural and economic development, Eva Landry epitomizes community service. Her illustrious career in education began in 1953. She was a teacher, a principal, a reading specialist, and twice made history: first in 1979 when she became the first woman to be appointed Superintendent of Schools in Richmond County, Cape Breton, and again in 1980 when she became the first woman to be appointed Inspector of Schools in Nova Scotia. For over fifty years she has served as a 4-H leader, actively promoting the youth development organization both in Canada and abroad. 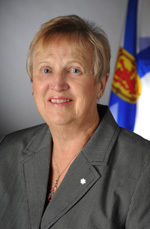 For the past twenty-five years, she has also shared her exceptional leadership as a volunteer with Nova Scotia Hearing and Speech Centres, where she has worked diligently to maximize access to hearing and speech services for children and adults throughout the province. Eva Landry is well known for her tireless community involvement in her life-long home of Richmond County. A colleague in the Richmond County 4-H Leaders Council wrote, "If there is a cause in the area that needs support, she is more than willing to pitch in. She has probably done more than any other one person in our area to benefit her community and its residents." Eva Landry is an exceptional role model and an inspirational leader. Guided by a strong sense of public service, William Pope - minister, care facility manager, publisher, and philanthropist - selflessly served his community his entire life. 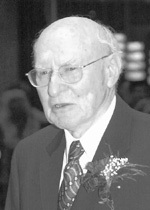 After seven years as a United Church minister, Bill helped establish Windsor Elms Senior Citizens Home and served for ten years as the home's first manager. A love of books then prompted him and his wife, Isabel, to establish a small publishing company. Over the next twenty-five years, Lancelot Press published more than five hundred books, as well as inspirational magazines and newsletters. Bill's son, Robert, an artist, died of cancer in 1992 at age 35, shortly after completing a series of 96 paintings based on his experience of illness. From the monetary donations made in Robert's memory, and from their own resources, Bill and Isabel established the Robert Pope Foundation, a charitable foundation to foster health and healing through art, education, and community health initiatives. 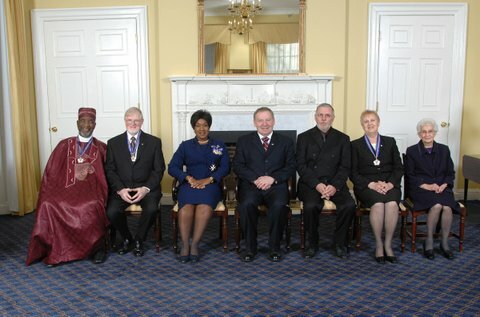 The Foundation supported an international tour of Robert's paintings, exhibiting them at every medical school in Canada and many in the United States, United Kingdom and Australia. Robert's book, Illness and Healing, published by the Foundation in both official languages, is given to first year medical students so they can understand illness and healing from a patient's perspective. The Foundation provides scholarships to art students at NSCAD University, supports the Medical Humanities Program at Dalhousie Medical School, and contributes to palliative care facilities and hospices, among other initiatives. Despite his great personal loss, Bill was compelled to give - generously, quietly, and selflessly.